JayWalk - All Your Xmms Are Belong To Me: Who Is My MP Ah? The Sunday morning that I was back in Singapore, we drove down to Ghim Moh market for breakfast. I was soooo looking to eating all the home food from Nasi Lemak to Otak to Prata to Kopi-O Gao. As I was driving, my wife pointed to the banner on the lamp post. 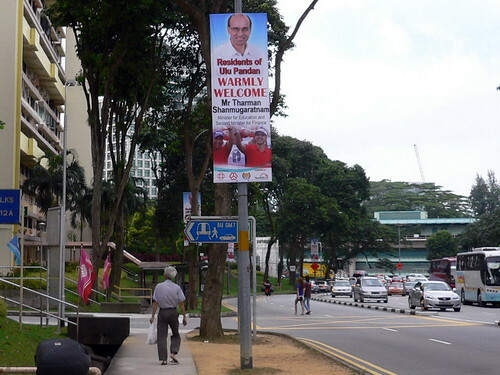 Wife: Naaiiiirrrrr.... the Indian guy on the banner lor. That Tharman guy. Wife: Yah. Yah. I think our constituency is Ulu Pandan. See the banner there say "Ulu Pandan". I think today is "MP Visit Ghim Moh" residents day or something. Me: Ok, I learned something new today. All these days of walkovers and election boundaries anyhow draw here draw there, GRC anyhow sukah sukah zone here zone there. It is good to finally know who our MP is. I thought we last time is Ayer Rajah GRC one? Now back to Ulu Pandan har? As it turned out, Mr Tharman Shamugaratnam was the VIP of the day and not our MP. ..... we also don't know where we are as there is no such constituency named Ulu Pandan anymore. Wah lau. hahahahhahaa.. I know how to pronounce his full name sia. 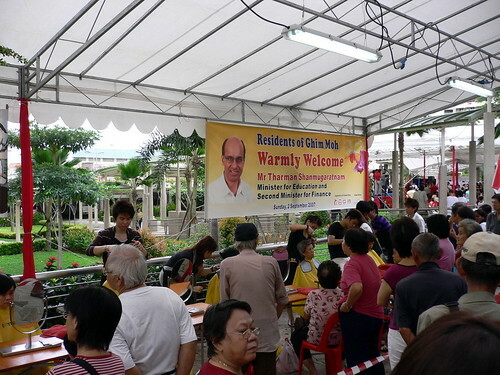 Tharman Sharmugaratnam (spelling correct or not I don't know). He came over to my school's opening ceremony and we had to listen to his name a zillion times. Ollie: His name isn't that difficult as long as you are able to break it down. It's quite a mouthful though, but it is still relatively easy for me. I wanted to go find out what my constituency is but gave up the idea after like 1.3 seconds, thinking that they are going to rezone and rename it anyway. So why bother? Ghim Moh, stayed there for 10 over years before moving out and still visit the hawker centre with my cha-bo-lang as it is only few minutes drive away from my current place. Old Beng: On lah.... Christmas we go la kopi. Sure, we can la kopi, eat prata, sing carols. Old Beng: Day time, Ghim Moh market sing carols, people think we siao. Speaking of siao, last time, there is this crazy woman roaming the market everyday, you know what I talking about? Eh... Your place should be under Holland-Bt Timah right? ZheBin: After checking. Yeah. You are right. I am Bukit Timah/Holland. Old Beng: Wah kaoz.... there is 2 of them? I didn't know that! I supposed I refer to both of them bah...... have you ever seen two of them appearing together at the same time? I moved to Ghim Moh side in 1980. I supposed it the mother that I have seen. She has a daughter? Who the hell is the father??? Yes, I have seen both of them together. The last time I saw them was like 1 year plus ago and usually it is the daughter who sings. My guess is that the mum is about 50+ and the daughter 30 +/-, me no good in guessing women's ages. Who is the father? Not me!!!!!!! (Must faster clarify) Just joking la, I really don't know. They are quite harmless except once I saw the mother scolding the daughter. Old Beng: Seriously if you ask me, I haven't the faintest idea if the one that I saw is mother or daugther. Sorry, the indian guy is my MP. jurong area one... hahha... But i never see him around one..
Chocolate Gal: Since when you Jurong? I thought you Bukit Batok one? Was the first photo taken near Ghim Moh Sec School? I liked eating at the hawker centers. Everton: If you look at the second picture, you will see a building with a blue roof in the background. That's Ghim Moh Secondary School. They have since built a multi-storey carpark in between.